Bigelow herbal tea is the star in this brined pork loin - delicious! 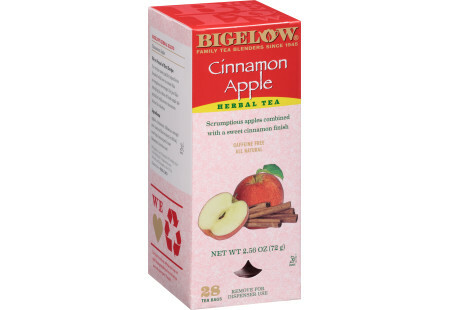 Bring one quart water to a boil and add Cranberry Apple and four Cinnamon Apple tea bags. Let steep five minutes. Bring second quart of water to a boil with salt, sugar, carrot, celery, onion and garlic. Combine first two quarts of water with a third cold quart of water, making three quarts total and let cool. Add pork loin and let sit in refrigeration for four to six hours. While pork is brining combine pickled cabbage. Heat vinegar to boil and add Orange spice and four Cinnamon Apple tea and let steep five minutes. Combine cabbage, onion, apple and pour over tea and agave syrup (or sugar). This can sit until cabbage, onion and apple is whilted (which may require overnight), be heated and chilled or put into a vacuum sealer under full pressure (twice to get full effect). Pre-heat oven to five hundred. Season outside with Black pepper and Kosher salt (just enough salt to lightly cover top of roast). Place roast in hot oven for ten minutes (until outside begins to turn brown). Reduce heat to three hundred and cook till 145 degrees internal. Let rest fifteen minutes and slice thinly. Serve with pickled cabbage and apple.